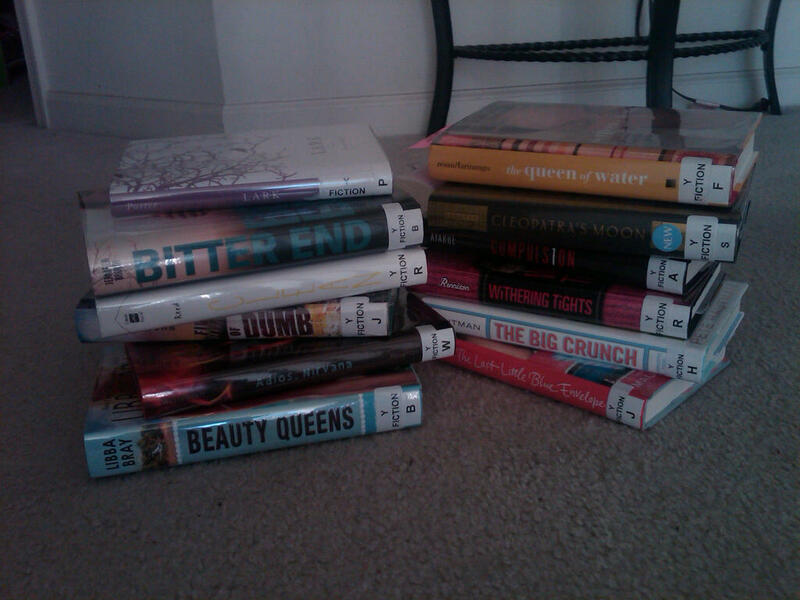 In honor of Teen Read Week, I’ll try and post a review of some of the Cybils noms I’m reading. Two weeks into it and being a first round judge is all that it’s cracked up to be. All YA, all the time. I’m a “mental” reader, meaning I like being prepared for what I’m about to experience. So I love when a book’s premise is in my face obvious or when the story within matches the jacket flap. Clean’s title and book cover featuring a weary, tousled hair teen told me what I needed to know – it’s about addiction. No surprises. The only way the book could disappoint would be for Reed to take the easy way out and make it a predictable tale of triumph over addiction – making every character squeaky clean (pardon the pun) at the end. It didn’t do that. The story moves at a fast, but not hurried clip. Periodic drug and alcohol history questionnaires, peeks into their group sessions, and personal essays reveal what led each character to addiction, but Kelly and Christopher stand out as the main protags. It’s through their observations that we watch each character evolve from their addiction, cleansed of at least the primary scum of their demons. Reed successfully avoids an apple pie ending, choosing instead to arm the characters with both hard truths – they will always be addicts- and hope – recognizing that fact may help them make better decisions in the future. There’s a constant debate when it comes to YA fiction about the absence of parents and how unrealistic it is when parents are in absentia. I think the reality is, parents are often somewhat absent during a child’s teen years, not physically but maybe psychologically. A parent can see their kid every day and still not necessarily know what he or she is going through because teens begin processing for themselves and sharing what they want as much as they hide what they want. This is represented well in Clean. If the questions of- how did these kids get so far gone and where were their parent(s), arises, each character’s situation felt like a realistic answer to them: exaggerated parental expectations, an obese bible-thumping mama out of touch with her son’s needs, a child who feels forgotten because of her parent’s burdens and the loss of a parent. Not one of the situations was unlikely. The fact that the kids chose to deal with it by turning to drugs or alcohol (or both) was the point. Most refreshing about Clean was that rather than showing these kids as angry addicts who got high to get back at their parent – the classic slacker syndrome, nearly all of them were ashamed of their vice. They still wanted to please their parents even though they all knew, on some level, their parental situation had enabled and in some cases caused the addiction. It’s a side of teen addiction I hadn’t seen showcased before. It made the journey enjoyable, if one can say that about such a damaging and tense topic. If you’re looking for gory detail on withdrawal or a tutorial on how to get high, Clean’s not your book. If you want stark reality from the character’s introspection and a little (just a bit) of counseling to avoid addiction’s pitfalls, then have at it. Deeeeeep breaths. I’m actually a little jealous, because middle grade only has 145 books on the list. Look at all the great books you will get to read!